The Doctoral School of Semmelweis University organizes PhD Scientific Days every year, where the students can practice their ability to present research results and discussion skills during a conference. The PhD Scientific Days are also a great opportunity for our university's Excellent PhD lecturers to present their science oeuvre. In previous years, participation in the PhD days was practically voluntary. With the introduction of the new PhD training system, however, the event gives the opportunity to all students to get tested without exam stress before the comprehensive examination, which completes the first phase of the PhD program. On the other hand, the PhD Scientific Days offers the opportunity for the scholarship holders to give the compulsory conference presentation of the now-established Excellency Scholarship. That is why we expect more applicants than usual to apply for PhD Scientific Days in 2019. Organizers are prepared to ensure that the size of the conference venue would not be an obstacle to as much participation as possible. 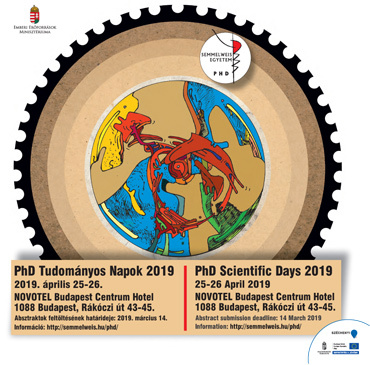 As the Head of the Doctoral Council I cordially invite our PhD students to the 2019 PhD Scientific Days. Address: H-1088 Budapest, Rákóczi út 43-45. All oral presentations will be 10 minutes long including the discussion. The presentations can be given in English or in Hungarian at the conference but you are suggested to prepare your slides in English. Presentations should be prepared in ppt / pptx format, and should be uploaded latest in the break before the session. If you have a special element in the presentation (video, flash object, special animation), please arrange the upload earlier and pay some time for a slidecheck. We would like to ask you to prepare and send us your ppt / pptx format English slides of the oral presentation before the conference. All poster presentations will be 6 minutes long including the discussion. The presentations can be given in English or in Hungarian at the conference but you are suggested to prepare your E-poster in English. Poster presentations are supposed to be by E-posters. The conference poster presentations will be presented on E-Posters, therefore printed posters are not needed. We would like to inform the participants of the conference that the language of the presentations is optional (Hungarian or English) but the slides and the posters are expected from the presenters in English.